He’s only 26 years old, where’s plain clothes, sneakers, hoodie, and if you walked into a bar you would probably never know that he was standing along the wall with his top deputies at Facebook; this is Mark Zuckerberg, co-founder and CEO of Facebook – you may have heard of it. In fact, if I’m a betting man, you actually have a profile on Facebook. Because Facebook now has 550 million users worldwide which is 1 out of 12 people who now have a profile. So the odd of you having one are pretty darn good. 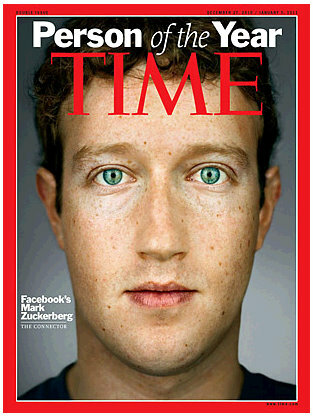 A couple of days ago, Mark Zuckerberg was named Time’s 2010 Person of the Year. A rightly reward seeing how Facebook now impacts the lives of so many people throughout the world – 75 different languages to boot. And oh yeah, 1 out of every 4 pageviews in the United States occurs on Facebook. But yet despite those rediculously, absurd, and incomprehensible numbers in the US, it’s even more amazing to think that 70% of Facebook users actually reside outside of the US. So congratulations Mark Zuckerberg, and thank you for creating Facebook in your Harvard dorm room when you were only 19 years old.